Musings from Beyond the Clouds » 12 Days 2010, #12: Apprivoise! The first episode of a series has a special duty; it needs to draw in a new audience, set up the world in which the series will take place, introduce the main characters, and so on. While these goals may seem to be at odds, a good series can introduce a world that is compelling, that motivates an audience to continue watching. Often, a series will start in media res, in the middle of the action, to accomplish these goals, but it will do so in a way that quickly explains the events that have already occurred. And then there’s Star Driver. 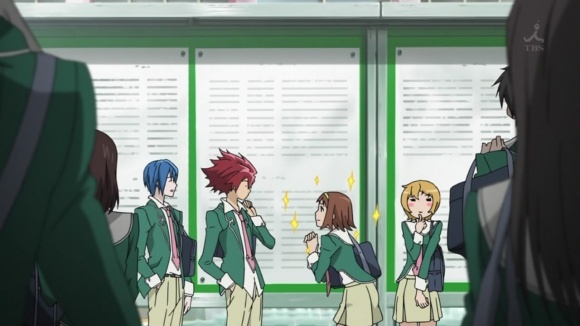 The first episode of Star Driver begins fairly normally–it introduces the main characters (including an island maiden and a boy who swims to the island from the mainland) and begins to set up the school environment they’ll be living in. The boy, Takuto, is in the same class as Wako, the girl who saved him and one of the island’s maidens, and Sugata, her fianceé. The show appears to be shaping itself into a pretty interesting school drama. Then, suddenly, we’re faced with a group of masked villains, complete with secret salute (KIRABOSHI!). They attack one of the island’s maidens with a “star sword”, and because of this, their organization, the Glittering Crux (KIRABOSHI!) enters the “second phase”. Masked henchmen kidnap Wako, and Takuto attempts to rescue her, but is himself captured. 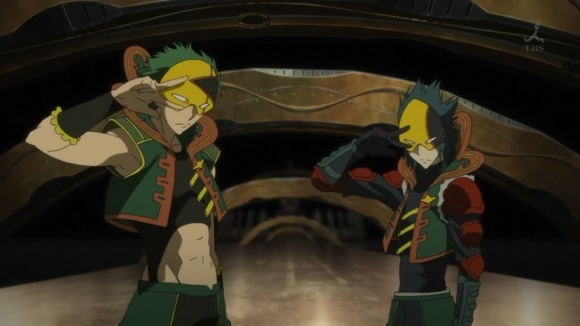 One of the masked henchmen climbs into the “cybercasket” and substantiates a giant robot, which promptly halts the flow of time, leaving Takuto frozen. Just as the villains are about to perform their dastardly deeds upon Wako, Takuto bursts onto the scene, revealing himself to be the Galactic Pretty Boy (GINGA BISHOUNEN! ), and summoning a robot of his own in a transformation sequence–a FABULOUS robot, complete with high-heeled boots and a feathered cap. He dispatches the villain, saves the girl, and the episode ends. None of these events are explained at this point–none of the motives, means, or situations involving the Glittering Crux or its members are revealed. Takuto is not only recognized as the “Ginga Bishounen”, but the characters seem to be both aware of this role and completely unperturbed by the ridiculous title. In general, the whole episode is a baffling exercise, leaving new viewers completely confused by events–and at the same time, it’s amazing. Stupendous. FABULOUS. 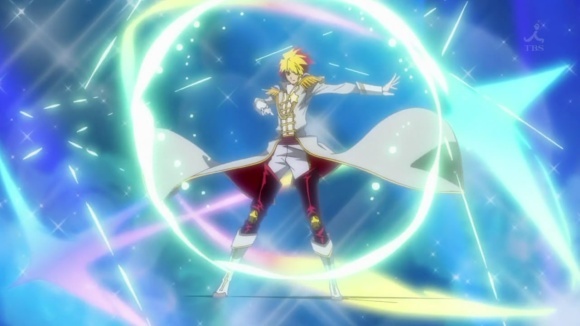 Star Driver has all the cliches–transformation sequences, magic powers, secret character aliases, and named attacks. There’s a mysterious secret organization that continually harasses the protagonist, complete with secret handshake. It follows a villain-of-the-week format, where Takuto easily dispatches a new member of the Glittering Crux every episode. 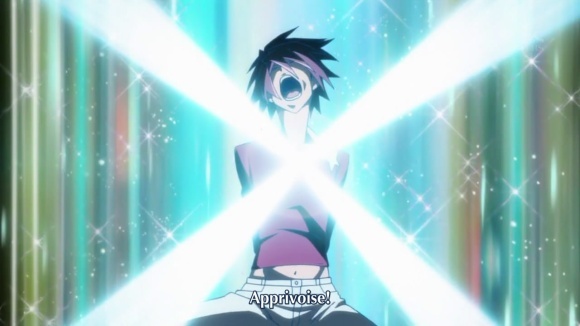 If it were any other show, I’d hate everything about it; but somehow, Star Driver is too FABULOUS to hate. Maybe it’s because after 11 episodes, they haven’t let it get old–even after the reused animation and predictable plots, every new episode of Star Driver is just as insane as the first. It hasn’t stopped spouting ridiculous nonsense at the audience with a straight face, and it hasn’t given up and admitted it was a joke all along. Star Driver still acts like everything is a dramatic revelation, from new characters to crossing legs, and that makes this Moment #12.